The Grand Valley State University student senate will hold a discussion Wednesday, April 11, from noon to 1:30 p.m. in the Kirkhof Center, Room 0073. The panel is part of the GVSU Community Service Learning Center's Democracy 101 initiative, which consists of biweekly co-curricular lectures, panel discussions and workshops that focus on democratic values and systems. The presentations included topics on democratic participation, social movements, the role of journalism, student civic development and more. This series started in response to the post-election town hall meetings in winter 2017 where students, faculty and staff presented questions about democracy. This discussion, which will focus on student senate's role at GVSU, will be the last one for this semester's series. Titled "Student Senate: Roles, Responsibilities and Possibilities," this talk will allow attendees to learn more about the duties of the senate body. “Student senate is important to represent students and what they like," said Kelly Hancox, a student manager at the CSLC. "For example, last year, different student senators tried to get more hours at the counseling center. They fight for what students might need. A couple of years (ago), they created new minors: the human rights minor and the digital communications minor. At the event, student senators Carly Aller, Rachel Jenkin and Anna Szalay will be answering questions and talking to attendees about how they operate within the political climate as well as the outside community. 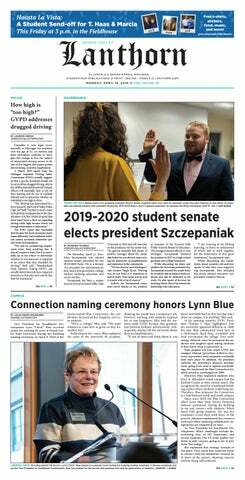 “I hope that students who may not be familiar with the student senate learn more about what they do and also learn how the governing body tries to operate in a divisive climate," Hancox said. "We will be asking student senators how they feel at work when people have polarized views. People have pretty disparate opinions, and it’s interesting to see how the body operates. This lecture will be LIB 100- and 201-approved. Lunch will also be provided for attendees.